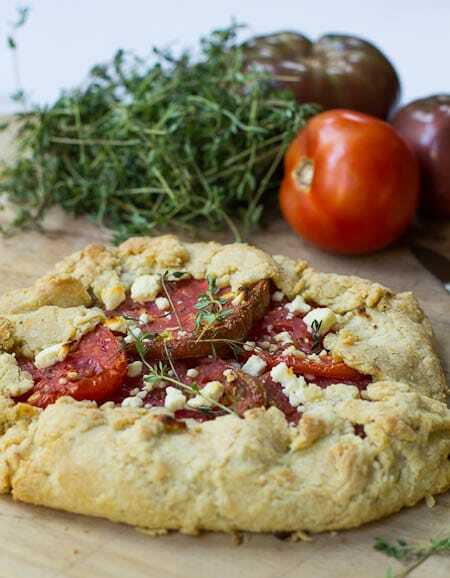 Tomato Galette with Feta makes great use of the summer tomatoes which are more than plentiful right now and is the perfect accompaniment to a salad for dinner. Even if you are not real comfortable making doughs and piecrusts, you can make a galette. Since galettes are freeform, they are so easy to make and pretty much anything goes. 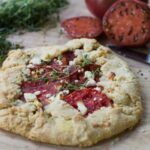 This galette is very simple to put together with a mixture of cream cheese, feta, and roasted garlic spread on the bottom, topped with tomato slices, more feta, and thyme. You could easily change things up by using goat cheese instead of feta and basil or rosemary instead of thyme. The cornmeal crust is David Lebovitz’s recipe and was published in Fine Cooking magazine. It’s a great dough for savory appetizers. The dough is fragile and tears easily as you work with it, but that’s nothing to worry about when making a galette. Just pinch the tears together. The more rustic a galette looks, the better. To roast garlic, heat your oven to 400 degrees, peel away the outer skin of a head of garlic, and cut away ¼-inch off the top. Drizzle the garlic with a little olive oil and wrap in aluminum foil. Bake for about 30 minutes. Let the garlic cool. It will be very hot. Once cooled, use your fingers to press each clove out of the skin. You’ll want to use at least 8-10 cloves. Sounds like a lot, but roasting garlic really mellows its flavor. In a large bowl, combine flour, cornmeal, sugar, and salt. Cut in the butter using a pastry blender until no visible large chucks remain. (It’s often good to switch to using your fingers part way through.) Add olive oil and water and mix until dough comes together. Shape dough into a disk, wrap in plastic, and refrigerate for at least 1 hour. Preheat oven to 375º. Line a large baking sheet with parchment paper. Place tomato slices on paper towels for 5 minutes to soak up excess liquid. Sprinkle with salt and pepper. In a small bowl, mix together cream cheese and roasted garlic. Add half of the feta cheese. Set aside. Place dough on a lightly floured surface. Roll dough out, lifting and rotating the dough every few rolls so that it doesn’t stick to the surface. Use more flour if necessary. Once dough is 14 to 15 inches across, move it to the baking sheet. Bake for 40 minutes and cut into slices to serve. This entry was posted in Appetizers and tagged appetizers, galette, roasted garlic, tomatoes. Bookmark the permalink. Mmmm, those tomatoes look delicious. I love cooked tomatoes. And feta and cornmeal are such a great bonus! I love the rustic look of this dish. I especially love how it is very easy and doesn’t have to be perfect. Pinning! Thanks Gloria! Non-perfect baking is about the only kind I can do. HOLY YUM! 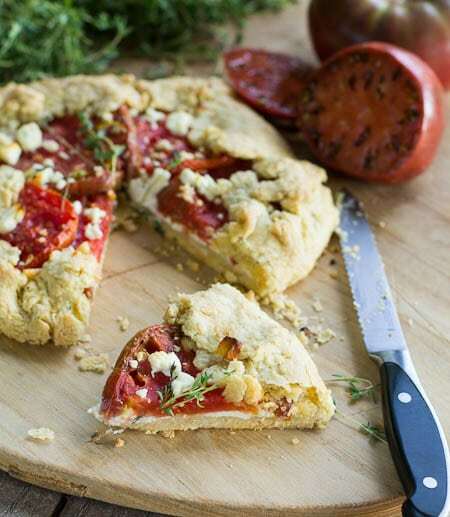 Love the combination of tomatoes, feta, roasted garlic, and cream cheese. I bet this is awesome. Pinning and thanks for sharing at Show Stopper Saturdays Christin! This is such a pretty dish! And those brown tomatoes are my favorite! Holy freaking yum. This is brilliant my friend! This is one delicious looking galette!! I really need to try making one sometime soon. Have a great weekend! Thanks Ashley! Hope you have a great weekend too! Christin – this looks amazing! 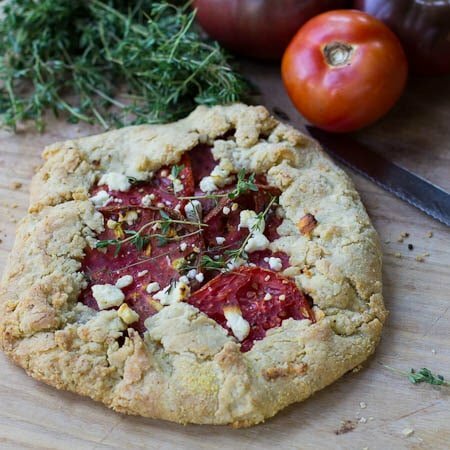 What a beautiful way to use garden tomatoes, I can’t wait to try! Thanks Pamela! And I know you have plenty of tomatoes in that wonderful garden of yours! This galette looks so lovely!! I’m sure it tasted amazing!! 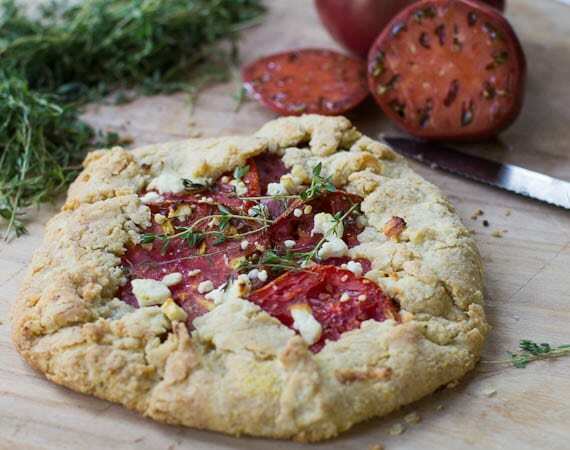 This looks awesome and I love that you used a cornmeal crust! In addition to the sweeter flavor that pairs so well with tomatoes, I think the yellow tint looks so pretty next to them 🙂 Your galette is beautiful!! You definitely need to make a galette Ashley! They are so easy and the ingredient combinations are endless! That looks so good I am tempted to break my no flour rule!